Dimensions: 10 x 4-3/4 x 2-1/8 in. For ages 3 and up. 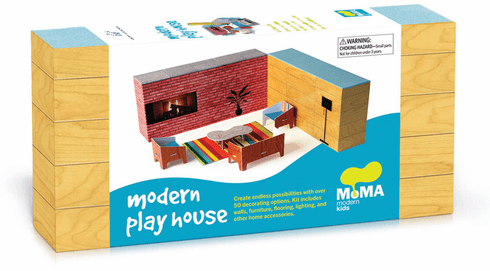 Create a delightfully modern house with this innovative set of modular nesting boxes! Aspiring architects and designers of all ages can create modern spaces, arrange furniture and accessories, and pack it all up to go with this distinctive house! Includes: 6 nesting boxes, 8 mix-and-match furniture pieces, 12 removable vinyl clings, and endless possibilities!